First Line: "Muriel!" I exclaimed. "What a lovely surprise. Come on in." When the one and only copy of Iris Stanford's manuscript never arrives at her publisher's office, daughter Kat's investigation leads straight to the tiny village post office-- where it seems the manuscript never left the building. Now Iris is in a right state. Not only is her publisher breathing down her neck for the book, now she's petrified that Muriel Jarvis (postmistress and Gossip Central) will expose her secret identity as the bestselling romance writer Krystalle Storm. Muriel has her own problems, what with her husband's recent death leaving her in oceans of debt, and Kat is finding that getting her antique business up and running isn't going as smoothly as she'd hoped. Then there's the Civil War reenactment at Honeychurch Hall that's ruffling all sorts of feathers. Something tells Kat that she's going to have to put the start of her business aside so that she can ride to the rescue of all those about her... one more time. This fourth installment of Hannah Dennison's Honeychurch Hall series is every bit as delightful as the other three. These mysteries have all the hallmarks of a writer who's loving every minute of her work. Her stately home setting allows Dennison to enlighten readers about the very real problems faced by the owners of such properties, and her method of showing how an extremely eccentric family tries to stay afloat and save their home takes away any appearance of this being "a lesson." In addition, having a family who's lived in the house for centuries lets the author bring to light all sorts of family skeletons-- like the one uncovered in time for the Civil War reenactment being carried out on the property. As always, the cast of characters shines. I really liked the fact that Kat is actually starting to get her antique business off the ground. Readers get to meet a family black sheep named Piers and a very young wife named Jess, and busybody Muriel plays her role to perfection. I have to admit that Kat's mother Iris still annoys the stuffing out of me (let me count the ways! ), but Dennison has so much fun with her that I won't complain. There's so much to like in this book-- and the entire series-- that I could go on forever. This Honeychurch Hall series is one of my favorite cozy series, and if you haven't tried it by now, I hope you will in the very near future. 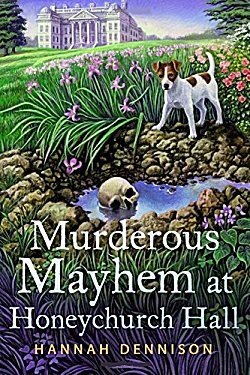 Due to character development, I suggest you start at the beginning with Murder at Honeychurch Hall. You have some wonderful reading ahead of you! So glad you're enjoying this series, too, Cathy. I think it's got just the right mix of wit, mystery, the whole thing. I agree-- but then you knew that already! I am looking forward to reading this book as the Honeychurch Hall series is one of my favorite cozy reads too. When you wrote that the author has the hallmark of loving every minute of writing her work, I agree. I feel that way about Charlotte MacLeod too. I can always see her smiling as she wrote her books. I want to thank you for your blog yesterday of Cozy Con at the Poison Pen. That was an interesting article that you shared with us. It was appreciated very much. Thanks, Lynn. I'm glad you enjoyed it.